SAVANNAH, Ga., Jan. 17, 2019 /PRNewswire/ -- Gulfstream Aerospace Corp. reaffirmed its commitment to sustainability by using sustainable alternative jet fuel (SAJF) to power a record-breaking flight by its class-leading super-midsize Gulfstream G280 aircraft. The Savannah-to-Van Nuys, California, journey covered 2,243 nautical miles/4,154 kilometers in 4 hours and 49 minutes at an average speed of Mach 0.85. 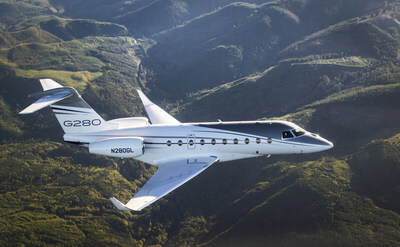 Flying through headwinds averaging 76 knots, the G280 demonstrated the aircraft's continued high performance with SAJF. Wednesday's city-pair record, along with a G280 demonstration flight on SAJF today for media members and others, is part of an industry event designed to promote the development and adoption of SAJF, Business Jets Fuel Green: A Step Toward Sustainability, at Van Nuys Airport. "Gulfstream has been involved with SAJF since June 2011, when a Gulfstream G450 became the first business jet to cross the Atlantic on a blend of the fuel," said Mark Burns, president, Gulfstream. "Since then, we've taken ever-greater steps in supporting sustainability, including securing a dedicated supply of SAJF for our corporate, demonstration and flight-test fleet. Our company aircraft have already flown approximately 700,000 nautical miles on SAJF, saving more than 750 metric tons of carbon dioxide. SAJF is not only better for the environment, but using this fuel to set city-pair records highlights its performance capabilities. "We're now elevating our sustainability commitment by bringing SAJF to our facility in Long Beach." By mid-2019, Gulfstream expects to offer SAJF to customers using the company's Long Beach facility. It also plans to use SAJF for its large-cabin completion flights departing from Long Beach Airport. Gulfstream's sustainability strategy helps support the business aviation industry goals established by the National Business Aviation Association, the General Aviation Manufacturers Association and the International Business Aviation Council. In addition to the goal of carbon-neutral growth by 2020, the industry-wide targets include an improvement in fuel efficiency and reduction in total carbon dioxide emissions.